The reason I wanted to see Otello was to hear Renée sing The Willow Song live. During the early winter of 2002, I discovered Renée because her 2002 concert at the Châtelet in Paris was shown regularly on the Ovation Channel. It was my first winter in New York City. I lived in a very expensive apartment so I wasn't seeing very many live performances. I was broke. I was cold. I was lonely. Renée's voice was so beautiful that it helped me through that first winter of so many adjustments. I had not been an opera fan at all and knew very little of classical voice. Since then Renée has inspired me to discover other singers, new operas and meet new friends. Hearing her sing The Willow Song live was a dream come true. There was no need to get weepy or jump for joy, it just simply happened and I'll never forget it. I feel deeply satisfied. And I am forever grateful. Written in 1887, Otello is Verdi's second to last opera. Of the Verdi operas I have seen - Aida, Don Carlo, Rigoletto, Simon Boccanegra, La Traviata, Macbeth, and Falstaff - Otello has two of my most favorite soprano arias, The Willow Song, of course, and Ave Maria. The duets between Desdemona and Otello, played tonight by Johan Botha, are gorgeous. It's a frightening story, full of marital violence based on jealousy and misunderstanding. I had seen it once before with Heppner and Frittoli and enjoyed it then, but it's not my favorite and once during a run is definitely enough because of its intensity. Elijah Moshinsky's production is huge and in the style of grand opera. It's overwhelming at times and while beautiful, sometimes it's just too dark. Peter J. Hall's costumes are sumptuous. One of the most beautiful scenes takes place during Act II. During the castle garden scene of Act II, Desdemona is greeting children while they are singing. It's incredibly tender. The children give her boquets of flowers. Renée's daughter was a part of the Children's Chorus last night and was one of the girls who handed flowers to her. It's one of my favorite scenes in all of the operas I've seen. The set seems to go back forever and the horizon is the ocean. It's quite beautiful. I was unexpectantly impressed with Botha. He did no more than stand and deliver when I saw him last season in Don Carlo, but he was completely in control as Otello. Aside from his beautiful voice, I had no trouble believing that he was the irrational husband jealous enough to murder his innocent wife. If there ever was an opera I wish I could "2nd Act", this one would be it...well, make that 3rd and 4th Act. Awww, congratulations on having your dream come true. You do such a great job of describing why you love opera. That scene is in the 2nd act. Thanks Alex. My eyes weren't focusing very well when I was reading the playbill at 1:00 am, plus I was still a little high from experiencing that. You probably have also seen La Traviata among Verdi operas. Oh Matt, you're right. Freudian slip that I missed that one? I just find it so damn boring. I've seen both Gheorghiu and Fleming do it, as well as heard it at Central Park in '06. Great report! Doesn't Act IV get you every time! Would it be weird if I confessed that I squealed when I saw Renee's signature on the playbill?? Okay, well there it is!!!! You're so lucky!!! Sarah, what a beautiful report, as always! I really loved the first paragraph about how you discovered Renee :D I'm so glad you had a fabulous night and now you made me super excited to see it live soon!! you like the desdemona small and lyric. takes all kinds. Please tell me how you got your playbill signed by Ms. Fleming. 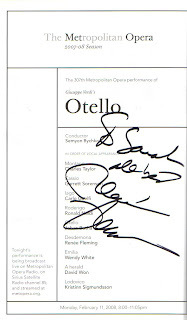 I'm seeing Otello on Friday and would love to have that opportunity. It'll be my first opera and that would just be the icing on the cake.